Home / Blog / What Happens if a Crucial Member of Your Team Says They Are Leaving? So, things are running smoothly in your business, you have a full team of staff, you keep meeting deadlines and your key stakeholders have bought into the new HR strategy. Things couldn’t be more perfect. But, what if one of the key members of your team told you they were resigning? It’s completely unexpected and you aren’t sure how to react. Do you feel offended? Betrayed? Or are you annoyed that this has put a spanner in the works? Whatever the feeling may be, it is important that you don’t take these things personally, after all you won’t be able to hold onto every member of staff. Yes, it may seem like a kick in the teeth now but surely you don’t want to hold any of your employees back or make them stay in a company they no longer want to be in. It is also essential that you gain the most out of this situation and carry out the correct procedures to gain an insight into why they are leaving, especially if it has something to do with you or the company. 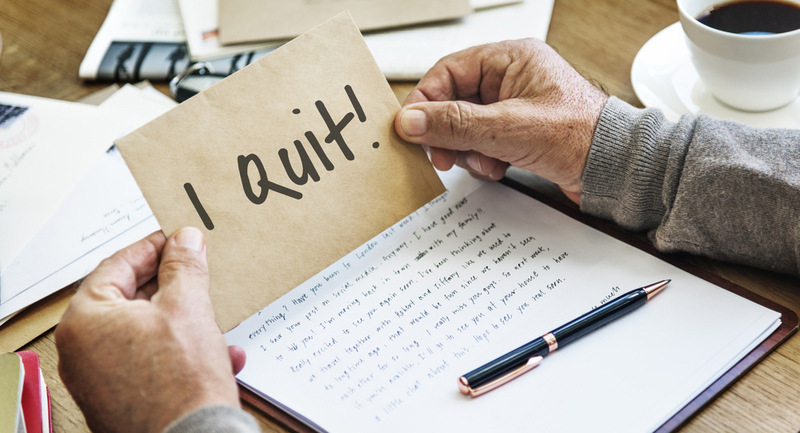 Once your employee has handed in their resignation letter, it is important that you schedule an exit interview as this will allow you to get some valuable feedback and find out why and when they are leaving. Remember though that you are the boss and may, therefore, not get the entire truth, but you must make sure that you take the information you do gain on board to ensure any other members of staff do not resign for the same reasons. Establishing an end date will also help as this gives you time to follow the next steps and decide what action needs to take place. Do you need to contact an recruitment consultant to hire a new recruit? Or can another member of staff take on their responsibilities? When your interview is coming to an end, it’s a good idea to thank the former employee for their service. You want them to feel appreciated and understand that you don’t hold any anger or grudges towards them, they played a key role in your team and helped you get work done - show your appreciation, don’t end on a bad note. Are all your members of staff working at full capacity? Or can you spread this new workload across them? Make sure you evaluate this situation. If you need a new recruit soon, ensure you contact a recruitment consultant to gain a brand new, experienced member of staff in a shorter time period. Even if you can spread the workload for the time being, it is still a good idea to contact an experienced recruitment consultant but take your time with the process, list every quality you like in an employee and they can then try and find that for you. Now that you’ve evaluated the situation, make sure you tell all the relevant people which team member is leaving. This is crucial as some of those employees may need to take over particular roles until you gain a new recruit. This will then give you more time and allow you to fully decide what steps you want to take, whilst making sure other staff aren’t bombarded with a new workload. After the dust has settled, you must keep an eye on the exiting employee during their notice period as this is when many people tend to get lazy and develop a negative attitude. They’re leaving soon so why should they bother? Obviously, this doesn’t happen with everyone as some people like to leave their current job on a positive note. Make sure they’re doing their job properly, they haven’t left their position yet so why should they act any different? If things get really bad, you can reconsider how long their notice period is and shorten it if you feel it’s necessary. If you need some advice and guidance on how to approach this situation, are looking for any further information or want to contact a recruitment consultant, contact Wright Solutions today on 0121 222 5599 or email to info@wrightsolutionsltd.com.